Does It Count As a Tearjerker if the Book Punches You Until You Cry? A Boston Magazine article describes an MIT Media Lab project that aims to enhance the regular reading experience via a wearable vest. My childhood was filled with books; therefore, it was filled with pages upon pages of red-haired heroines. From Anne of Green Gables to Aerin of The Hero and The Crown to Alanna of Tamora Pierce’s books, I voraciously read books about women who were different from the crowd. These weren’t swooning ladies looking for a rescue. They were misunderstood and often fiery. Like their hair. And how I longed for red hair. Red hair would mark me as different, yet lovely. A beautiful force to be reckoned with. Red haired protagonists are teased about their hair, but everyone knows they’re actually beautiful and special. Cracking open a book is a familiar phrase that describes reading a text for the first time, but cracking open a Kindle (or iPad) is an alarming turn of events that will surely turn a good day into a bad day filled with customer-service phone calls. Advancements in technology are great, but what happens when advancements in descriptive cliches don’t keep pace? I was excited about the Fifth Wave. After all, before publication I was primed with marketing materials (first few chapters snagged at a conference), and I eagerly devoured them. I even had the classic, “I wish I had written this” yearning after reading those intro pages. All good signs. Let me back up and give the synopsis. 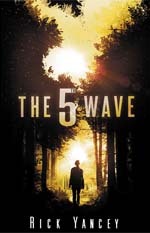 The Fifth Wave is about Cassie, one of the last survivors of the first four waves of mysterious alien attacks that have wiped out billions of humans. Humanity is teetering near extinction, but Cassie is determined to survive. She camps in the woods alone, kills, feels guilty, interacts with interesting family members, tries to figure out who is an enemy and who is a friend, etc. The story is told in first-person from her point of view, and I liked that approach. She’s also a book-lover and lugs around some favorite tomes–limited backpack space and alien apocalypse be damned. The whole first third of the book is tinged with a gritty, desperate air of mass extinction and survival at all costs. Like The Walking Dead, but better. 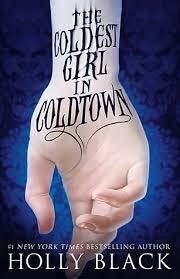 The book goes downhill, fast, when the author (Rick Yancey), decides to jump POV to Cassie’s little brother, Sammy. Then he jumps to a mysterious stranger dude, Evan, who saves Cassie and starts a creepy, awkward relationship with her. Then another guy, Ben, who is important to Cassie and is part of the brainwashing military compound. Basically, once Evan entered the picture and gave Cassie a weird bath, I was done. I just didn’t know I was done for a few more chapters. All the head-switching was difficult to follow, and all the characters but Cassie either annoyed me or creeped me out. Plus, even though I didn’t read to the end, I could see the plot coming a mile away. Who is mysterious Evan? You’ll figure it out many moons before the author thinks you will. And that’s no fun. At the very least, forbidden love should feel tingly and dangerous, not creepy and squirmy. So, I ended the book on my own terms. And I feel confident in saying Cassie wouldn’t have chosen this book to tote around in her apocalypse backpack either. After a spate of disappointing YA books, I ditched the genre for almost a year. Then I read this book. Now, I don’t want to oversell it or anything. Let’s put it this way–These Broken Stars didn’t change my life, but it did keep me sitting in a bagel shop well past the socially acceptable time to sit in a bagel shop when your bagel is gone. You may have heard that this book is “the Titanic in space.” That’s a fairly accurate tagline, IMO. The story starts when the aptly named Icarus, the galaxy’s foremost luxury cruiser, falls out of hyperspace and crashes onto an unknown, terraformed planet. Our two plucky survivors are Tarver (the Leonardo DiCaprio character with an earnest heart and empty pockets), and Lilac, the spoiled daughter of the richest man in the galaxy. The chapters alternate between Tarver and Lilac’s point of view. Interestingly, the two authors (Amie Kaufman and Meagan Spooner) alternated chapters. Amie wrote the Tarver chapters and Meagan wrote the Lilac ones. To their credit, the chapters were written in the distinct voices of the characters, but the overall novel felt seamless. Also on the positive side, the book moves along at a fast clip but, for the most part, doesn’t feel rushed. The setting of a terraformed planet is plenty intriguing, as are the mysterious, Lost-style happenings that plague the characters as they slog across the planet. It’s not a perfect book though. If you’re super annoyed by the archetype of the poor boy and the rich girl, be warned – yes, these characters fit the archetypes. If you have a low tolerance for bratty types, be warned that Lilac teeters on the edge of completely unlikeable for about a third of the book. Fortunately, Lilac learns her lessons and becomes way more likeable as the story progresses. Unfortunately, the ending doesn’t fulfill the potential of the wonderful beginning. Let’s just say there was a strange plot twist that didn’t actually seem necessary and made for a confusing, rushed resolution. The plot twist would have been great if it’d been the main point of an entirely separate story or of a philosophy course, but it felt tacked-on and awkward in this one. 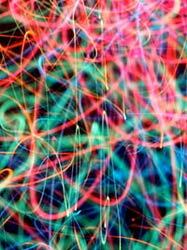 But to the book’s credit, I kept reading to the end, and the world and the characters lingered with me.